Photo by Andrea Juarez Sweet, tart apples in a spiced chicken stew. Fall is a glorious time of year. Green leaves turning golden and crimson. Brisk mornings and sunny afternoons. Best of all, apples abound — ready to be picked and eaten. It's no wonder October is national apple month. For people like moi, who think apples are the perfect fruit, it is paradise. My crisper is filled to the brim with locally grown Gravensteins, Fuji, Mutsu and a gorgeous mystery apple. If you are like the majority of folks, especially in the U.S., you likely only eat apples as a snack or in sweet dishes. This season, consider expanding your horizons and palate and delve into the savory side. The tartness and sweetness brighten many meals. For a burst of flavor and crunch, add them to a sandwich (try ham, sharp cheese, sliced apple and hot pepper jam) or chop up some for a kale or broccoli salad. I also like to cook apples like root vegetables. Stuff empanadas with apples, cheese and caramelized onions. Blend them in soups. Braise them along with meats (a la chicken Normandy). And, sear thick slices to garnish Moroccan chicken stew (recipe below). 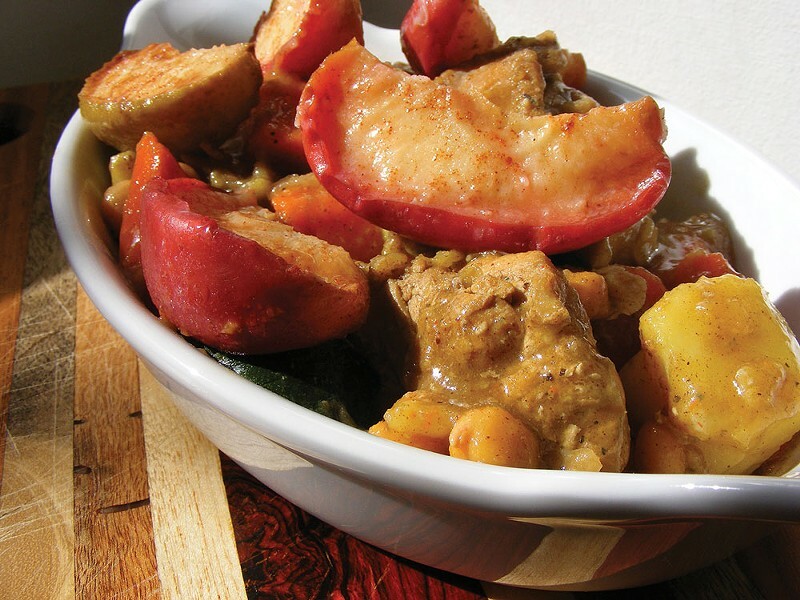 In Moroccan and North African cookery, fruit such as apples, pears, quinces, apricots, prunes and raisins are frequently added to meat dishes, especially tagines. I developed this recipe years ago and it continues to be a favorite in my house. 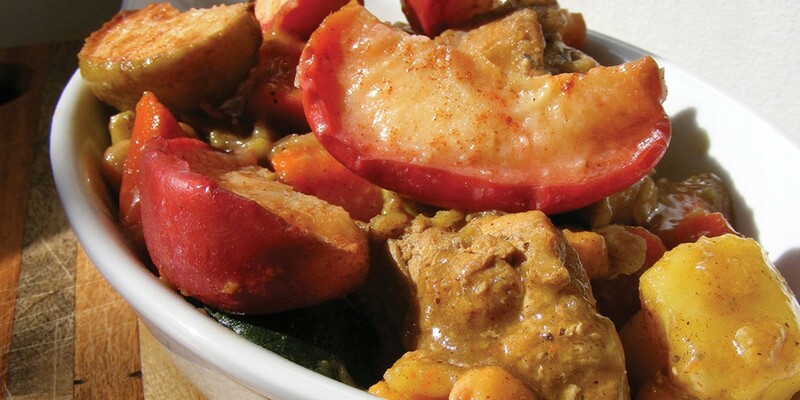 Those bites of warm, tender apple sprinkled with cinnamon and sugar are a luscious contrast to the rich and slightly spicy stew. One more thing. To make this stew, there's no need to buy a tagine (the cooking vessel); a Dutch oven or heavy pot will do. Try something new with your apples this season. After dinner, you can still have that apple pie. To make the stew: Generously season the chicken with salt and pepper. Heat a heavy deep skillet or Dutch oven on medium heat. When the pan is hot, add the oil and brown the chicken but do not cook throughout. Remove chicken and set aside. In the same pot, add the onions and more oil if needed. Stir until the onions become translucent. Next add the garlic, ginger, cinnamon, cayenne, salt and pepper and stir frequently for about 1 minute to allow spices to bloom. Return the chicken to the pot and stir. Add 2 cups water, carrots, potatoes and the can of chickpeas with liquid. Bring contents to a low boil. Cover and reduce heat to simmer. After 40 minutes, add the zucchini and leave it to simmer another 20 minutes or until the meat is cooked throughout and the vegetables are tender but not mushy. Cover and turn off the heat. To prepare the apples: Wash the apples, but do not peel them because the skin will help hold the slices together as they cook. Core and cut the apples into six wedges. In a separate large skillet on medium heat, melt the butter. When the butter starts to bubble, place the apple slices cut-side down in the skillet. Do not cook skin-side down. Sear them until they become slightly golden and caramelized before flipping them with tongs. The apples are done when browned but not falling apart. Remove them from the heat and place them on a plate skin-side down. Sprinkle with cinnamon and sugar. Keep the apple slices warm. Serve the stew over couscous. Garnish with chopped parsley and arrange the apples on top.